Today we’re pretty excited to launch a new dashboard design to everyone here on WordPress.com. If you have a few minutes, try clicking around and exploring the new layout and features. It’ll be unfamiliar at first, but like riding a bike you’ll find yourself picking up new habits and cruising down the road in no time. Those of you who follow the wordpress.org side of things probably saw the sneak peak that included several screenshots, the screencast of the new gallery feature, and the exhaustive list of features from the 2.5 release announcement. Now those improvements are available to you, including a few cool bonuses like a blog switcher menu on top. Cleaner, faster, less cluttered dashboard — we’ve worked hard to take your feedback about what’s most important in the dashboard and organize things to allow you to focus on what’s important — your blog — and get out of your way. In collaboration with Happy Cog and the community we’ve taken the first major step forward in the WordPress interface since WordPress.com was created. Dashboard Widgets — the dashboard home page is now a series of widgets, including ones to show you fun stats about your posting, latest comments, stats, people linking to you, and we’ll allow more customization here soon. Now you can put that 3gb of free space to good use! Search posts and pages — search used to cover just posts, now it includes pages too, a great boon for those using WordPress.com as a CMS. Tag management — you can now add, rename, delete, and do whatever else you like to tags from inside WordPress. In light of the launch, we’re also going to be keeping support open this weekend so you can let us know of any issues that pop up as a result of the new design. This new dashboard being out also allows us to roll out some other improvements we’ve been holding off for a bit as they didn’t make sense before. Keep an eye on this blog next week. 3,225,059 posts and 1,420,975 new pages. 863,470 active blogs, where “active” means they got a human visitor. Is there, or will there be, a way to arrange the “widgets” to see what we want to at the top and so on?? Thanks for a well-organized redesign. I already notice some improved access to bits of information about my posts that will help me manage and plan entries. Wow … it switched over while I was in the midst of writing a new post. Can you say, “Confusing? !” I thought I’d done something wrong or my computer had suddenly developed a bout of the flu. After I realized what happened, I was able to start adjusting to the new look/feel of the new dashboard. But what a shock it was at first! I hate the new dashboard design. Well, I love the design. I HATE the color scheme. I totally love the new dashboard design, Matt! It’s neatly organized and easy on the eyes, a quick and concise summary of everything I need to know, statistically speaking. As one who uses WordPress professionally — I’m on my blogs approximately 5 to 6 hours per day — I find that this is going to be quite helpful. Skyler, you can switch to the “classic” color scheme under your profile. We’ll be adding more color schemes in the future too, so every one of your blogs could have a different color scheme if you wanted. I just accessed my dashboard and felt I was in Disneyworld. Wee – what a ride! Wow, lots of page views. Thanks. Except that I was in the middle of writing a post and had just finished when I lost more than half of it because the dashboard had just changed. I’m going to go and play with it now. I didn’t realise the dashboard changed and got a fright when I saw it lol. I suppose I’ll have to get use to this new layout – I preferred the colours of the other one though. Nice. Really like the dashboard. I am not such a huge fan of the light blue theme particularly the menu at the top of the page, but that is such a little thing. What if you like the old dashboard? Sorry the old dashboard is gone forever. If you give this one a chance though it may grow on you. Brilliant, brilliant, brilliant! Far more usable with everything you need just one click away. 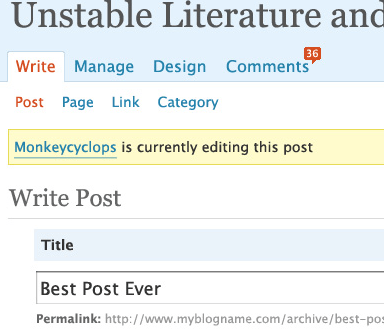 I love the blog stats summary and the tabbed options to switch between blogs. And the notice of how many comments are in the spam queue, right there at the top. Thank you!! Awesome! Compact, modular, colorful, user friendlier, like getting new software, like the more analytical arrangement of statistics, looove statistics, and did I say I like the new changes? It makes me think of Spring. It’s a springy sort of thing. I have a Mac, I use Safari… now I can totally enjoy my blog! OOH! Yummy! A great surprise! Love the new dashboard! I quite like the new theme, especially since it still works with my favourite browsers. Congrates on the 300000 new blogs last month. Well I woke up this morning, logged on, and I think it is great. I especially like the sound of the built in galleries. Absolutely love it. Thanks people! Everything’s really cool. Now, is it just my lucky day or the new 3.0 TinyMCE no longer has that annoying “automatic space removal”? (like when you have a new sentence and delete first letter of it, and it instantly delete the space before the letter/after the dot of the previous sentence) Thank God that is gone! Also, is there a way we can have a ajax-save-and-really-continue-writing? Without page reload? And at last, will our current and/or future RSS feeds not be cut-out if we use tag? Thanks for a great update and wrap-up! I was expecting this upgrade . Thank you for all you do for us bloggers ! The “save” button works like the “save and continue” button used to. The auto-save is a lot better too, so when you’re working on a draft it’s now saved at least once a minute. Your feeds are no longer cut off if you use the more tag. Ummm, where’s the authors widget gone? The author widget was broken/lost. It should be back now. Holy cow! What a shock when I logged on a little while ago. Looks pretty cool. I like it. I cannot insert a link nor check the spelling on my posts due to the new update. WORDPRESS IS THE BEST BEST BEST AND BEST BLOGGING SERVICE!!! It’s nicer and more helpful, it’s easier to find things in Dashboard too. I’ve seen some of this in a WP.org site. I’m still looking, but it’s very useful and pretty the new design. Sorry, but the first one was much better for fast and easy blogging. For example the Categorys. Now I´ve got to scroll – it was much easier on the right side. Wow! The new dashboard is absolutely amazing, seriously. It looks a lot cleaner and more organized. All of the pages are crisp, and the new wysiwyg editor is a great deal better than the old one. Good job. I absolutely love the new dashboard. Fabulous new look. Congrats! Yipes, and geee-zowee, I was writing away, got interrupted with the screen message about updating the server, and when I got back on everything was ….DIFFERENT. I’m figgerin’ it out! I think I like it, I think I like it. Yup, it’s gonna be good. Like already that I can change my categories without losing my entries, and the photo upload is much easier. Thanks so much. Just wish I would have gotten an email or advanced noticed as a screen message on the Dashboard that the change was coming 🙂 but no worries, I’m happy. No, just joking – the media library is quite nice. I have to say – I completely freaked out when I logged in just now but do like what I see so far – can’t wait to try the features out! Are you going to change the blue bar that goes on top of the blog when you are logged in to match the new red and white theme? zud3652, we’re planning to update the admin bar, but not sure when yet. I love the new design! Maybe I just needed a change, but it looks fabulous–prettier, cleaner, more accessible, and I can tell the images are going to be easier to work with now. The only thing is, and I know you can’t respond here–I haven’t yet figured out just HOW to post an image. I’ll have to go to forums, or you may here from me later. It is very unfamiliar. I preferred it as it was. The worst problem I have come across so far is the spell check, it does not seem to function now. Oh My! This is great! I was logging to my blog and what a change! love it! Loving it! Thanks for all the awesome goodies. WordPress rocks the house! The Media Library makes managing images much easier! Where am I? What am I doing here? What the heck?!? This is going to take a little adjustment… 😉 Thanks for taking feedback seriously. I was in the middle of writing a post when you made the change. I thought I had hit a wrong button or something and broke wordpress lol. It will take some getting used to, but I am sure it will be worth all the changes. I noticed that when the new dashboard was added, which I like very much, my author picture which was on a widget was instantly deleted from my blog. I made no changes to the blog with that picture or widget, so am assuming ‘something’ happened. It’s very very cool, but I’m having a few issues with the stats page. I’ve already sent an e-mail to you, guys. I don’t suppose there is a way to change that horrid orange color on the dash. jenefur, actually you can select the “classic” color scheme on your profile. We’ll be adding more colors soon. Seems very cluttered to me. I will get used to it though. I hate the new dashboard. Yes there are some new groovy gizmos. I was all excited about ideas for a new post and now I don’t feel like going there. I will but I don’t really want to. I despise the new Dashboard. It is too cluttered. I apologize for not thanking you all for all your hard work to make wordpress the best it can be. Well it is not working well for me yet. I have found it takes forever to get to the point where I can actually use the image I have uploaded. I like the fact that the bar indicates progress, but everything seems to stall once it starts “crunching”. Succesful uploads to blog after half an hour – zero. Stephen, the crunching is when it’s resizing it. If you’re uploading a giant image that might take longer. then i liked it ! Definitely cool guys. Good job, I’ll be looking forward to experimenting with things…hopefully my writers and editors will be able to figure things out. Thanks for the cool update, can’t wait for you all to allow google ads! The new dashboard doesn’t allow me to edit comments before moderating them. That’s unfortunate. Hansen, to edit a comment click on the commenter’s name. To edit a post click on the title. To edit your profile click on your name in the top right. Hmmm… the new dashboard was a big shock when I signed-in, but I think I’ll grow to like it. Thanks for all your hard work! Thank you for the dashboard update. I like the changes in general, but I feel that too much space is wasted in the current design, especially in the upper part of the page. Right Now orange bar is redundant since you can click Write from the same window. The title of the blog on the dashboard and the word Dashboard itself is too large. These are all minor things, but I just wanted to let you know.